The devil exists, and his greatest strategy is to convince us that he’s not real, that we have evolved beyond medieval notions of an unseen world. It’s hard to believe in the Gospels if you deny the devil, since the Gospel writers are all too clear on the subject of demons and their influence on the world – and on us. For those who do accept the reality of evil, we can take hope because we are not helpless against the devil’s attacks. Remaining in a state of grace, frequenting confession and Holy Communion, and developing a prayer life – these are the best defenses against satan. Fr. 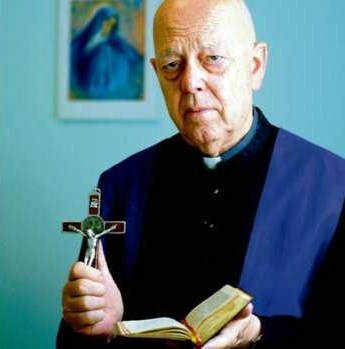 Amorth says, “When Cardinal Poletti asked me to take on this role of exorcist, I recommended myself to the Virgin: ‘Envelop me in Thy mantle and I will be in total security.’ The demon has often threatened me, but he has never harmed me.” Our Lady is the woman prophesied in Genesis who crushes the head of the serpent. Remain close to her, and the devil will flee. We give thanks to God today for the life and vocation of Fr. Amorth. May God continue to bless him in every way. In addition to the Lord’s Prayer and the Prayer to St. Michael, Fr. Amorth recommends the following five prayers of deliverance for protection against evil. Consider adding them to your morning prayers as a way to start the day. Spirit of our God, Father, Son, and Holy Spirit, Most Holy Trinity, Immaculate Virgin Mary, angels, archangels, and saints of heaven, descend upon me. Please purify me, Lord, mold me, fill me with yourself, use me. Banish all the forces of evil from me, destroy them, vanish them, so that I can be healthy and do good deeds. Banish from me all spells, witchcraft, black magic, malefice, ties, maledictions, and the evil eye; diabolic infestations, oppressions, possessions; all that is evil and sinful, jealously, perfidy, envy; physical, psychological, moral, spiritual, diabolical aliments. Burn all these evils in hell, that they may never again touch me or any other creature in the entire world. I command and bid all the power who molest me – by the power of God all powerful, in the name of Jesus Christ our Savior, through the intercession of the Immaculate Virgin Mary – to leave me forever, and to be consigned into the everlasting hell, where they will be bound by Saint Michael the archangel, Saint Gabriel, Saint Raphael, our guardian angels, and where they will be crushed under the heel of the Immaculate Virgin Mary. Amen. Lord Jesus, You know my burdens. I lay them all on Your Good Shepherd’s Heart. I beseech You – by the merits of the great, open wound in Your heart-to heal the small wounds that are in mine. Heal the pain of my memories, so that nothing that has happened to me will cause me to remain in pain and anguish, filled with anxiety. This entry was posted in Prayer and tagged exorcism, exorcist, Fr. Gabriel Amorth, prayers of deliverance by texasnuns. Bookmark the permalink.